The true story of Ron Stallworth, an African-American detective who sets out to infiltrate and expose the local chapter of the Ku Klux Klan. Spike Lee returns to form with the most culturally relevant film of the year that’s also a unique and compelling story on its own. This insane true story is told with dark humor but also resonance by the end. 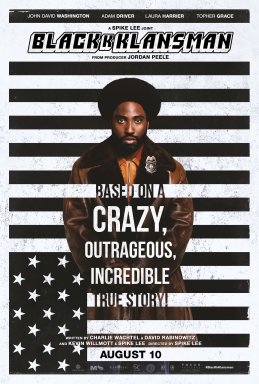 John David Washington makes a name for himself as Stallworth who is charismatic but also courageous and warmhearted. Adam Driver also stands out as the Jewish officer who takes on the task of infiltrating the Klan using Stallworth’s name. Lee makes the writing humorous but also very dramatic and affecting at times, as well as some suspense when the undercover cops are trying to keep their identities concealed. All these reactions — laughs, emotion, and thrills — are all blended perfectly to create this powerful biopic that won’t lose your attention until the end. Even though a couple scenes are written out too long and could’ve used less screentime, the movie knows when to pace itself well and keep you guessing at what will happen next. Not only is the production great as well as the main cast and Lee’s stylish and memorable direction, but also the themes the movie has that apply to the past as well as the present. The final moments of the film will leave you shaken at the consequences of ignorant hate that is still seen today, and maybe we can take away a message from this film about how we should treat those of another race or ethnicity fairly. With BlacKkKlansman, Lee not only crafts a dark and humorous story that’s engaging throughout, but will also leave an impact with its depiction of the issues our country (and our world) still faces today. With this movie’s theme of showing how we must let go of our hate and treat everyone equally, Lee has achieved relevance on a level higher than any filmmaker this year. That is why BlacKkKlansman, though not the best film of the year, should be seen by all and not be missed while it’s on the big screen.